While I didn't intend to read The Martian Chronicles- I was just happy to find it at the Library, I was, however, after Fahrenheit 451, which up until now, I had somehow manage to escape reading- and it was worth the wait, believe me. 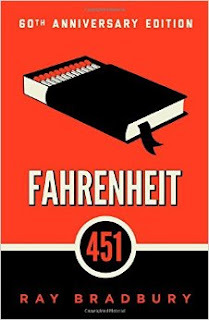 Set in a future America, where books are banned, Fahrenheit 451 tells the story of Guy Montag, the fireman- though these fireman don't put out fires, they round up books and burn them. (The title refers to the temperature at which books burn.) Books are banned and people get all their news and entertainment from 'television.' Montag is sleepwalking through his life as the book begins when he meets a new neighbor, Clarisse McClellan who is a free-thinker and talks about the past when people read books and learned things and pokes at Montag until he begins to look around and question his life and existence. He comes home that night to find his wife Mildred has overdosed on sleeping pills, calls for medical attention- but she doesn't remember a thing the next day. Montag keeps walking with Clarisse and soon begins to sort of expect her and maybe even look forward to their walks together, but then, she disappears. On a job a few days later, Montag steals a book before any of his co-workers notice as they ransack the house of an old woman for books that they're going to burn. But the woman refuses to leave her house and her books and chooses instead to light a match and burn herself alive. Montag, returning home hides the book under his pillow and tries to make conversation with his wife, only to realize how little he actually knows her and the fact he doesn't have much in common with her at all. She mentions in passing that she thought Clarisse had died after being struck by a car and her family moved away. Montag tries to get to sleep, but suspect that the mechanical 'Hound' that helps the fireman is lurking outside. Montag stays home sick from work the next day and tells Mildred he might want to quit, but Mildred isn't a fan of that idea because she likes his income and blames the woman who killed herself for having books. Captain Beatty, his fire chief comes by to check on him and tells Montag about how books became irrelevant and then were banned, casually mentioning along the way that every fireman gets curious and steals a book at some point. If it gets burned within 24 hours, then there's no trouble at all. After Beatty leaves it all falls apart pretty quickly for Montag. He reveals the stash of books to Mildred, who panics and tries to burn them. Montag insists that they need to read the books to see if they have value and if they don't, they'll burn them. Montag soon realizes that he'll need help understanding the books and finds an ally in Faber, an old English professor who agrees to communicate with him through an earpiece to help him through the difficult journey ahead of him. Unfortunately, Montag freaks out his wife's friends who end up reporting him to Beatty, who, despite Montag's efforts to pretend that he's back on-side with firemen and is all about burning books again, doesn't believe him and takes Montag to his own house to burn it down. Mildred leaves, refusing to talk to him and Montag burns down his house, but refuses to be taken into custody and goes on the lam. Faber gets him out of the city, where he meets the other exiled drifters who keep the knowledge of books alive. The threat of war that's been hanging over the book breaks open and the city Montag flees is destroyed by nuclear weapons. The next day, Granger, Montag and the other drifters head back to the city to rebuild civilization. Man, Ray Bradbury is fast becoming one of my favorite writers. I love his writing style- he has this unique ability to transport you into the moment- the whole sequence where the old woman refuses to leave her house and burns herself alive along with her books is incredible- probably some of the best writing I've ever read. But it's when Montag escapes the city and meets the drifters that Fahrenheit 451 makes it's most brilliant point of all: books are more than just physical objects- they're ideas the drifters that Montag assumes will have the books with them, instead carry the books in their head. When books were banned, they turned back to the oral tradition and when civilization is rebuilt they'll bring back the books and maybe do it all over again if civilization turns against them. You can destroy the books, but not the ideas. Overall: This book was well worth the wait. It's an incredibly powerful defense of knowledge and a searing indictment of ignorance. This one can go on the old Amazon Wishlist as well! Note to self: read more Ray Bradbury. **** out of ****.